Music of the highest quality for your big event: that’s what the Loring String Quartet guarantees for each and every client. As musicians of the highest level, our players can adapt to any situation in order to give you the kind of musical experience you’ve always dreamed of. 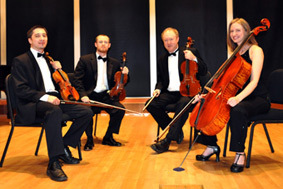 The members of the Quartet have performed extensively throughout Europe, Asia, and the US with such groups as the Minnesota Orchestra, St. Paul Chamber Orchestra, Leningrad Philharmonic, National Symphony Orchestra of Ireland. Add to this the many years of experience our musicians have in performing for special events, and you’ll be convinced that the Loring String Quartet is what you’re looking for.